The Travel Select Amsterdam Business Rolling Garment Bag (phew what a long name) is an excellent choice for shoppers looking to get the job done for little money. This is a rolling garment bag for budgets. Now I know that reading about rolling garment bags can’t be very exciting, trust me, I have to write about them. But the good news is there’s important information with this product that could make or break your decision to purchase this one. Hint: there’s a big reason to review this bag in regards to traveling with it. Read on below to find out in the functionality section. There’s not much to say when it comes to style with regards to rolling garment bags. They are simply created to hold a few pieces of clothes and tend to just be tucked in the truck or checked in at the airport. 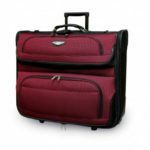 However in the off chance you want something that is fresh and has a little personality then you should consider the rolling garment bag from Travel Select. This rolling garment bag offers a few different choices with regards to the color of the bag if you wanted something to match your current set of luggage. I wish there were more options to give people a bit of uniqueness when it comes to their luggage but aside from the colors the only other neat thing about this bag is the fact that it has wheels… yeah thin stuff I know but I warned you there’s not much to talk about with style for a rolling garment bag. With ALL of a whopping one, maybe two features with regards to style, this rolling garment bag from Travel Select gets 4 out of 5 stars. This is purely for the fact that I don’t know how else you can make a rolling garment bag better aside from adding more colors; maybe if it came fully loaded with cash. This rolling garment bag is made with 40% 1200d polyester and the other 60% is just polyester. To give you an idea of what 1200d polyester means, let’s look to another category this site covers, backpacks. Most backpacks are made with 600d polyester while most of the tougher and more durable backpacks that are made for hiking have 1200d polyester. They are effectively twice as strong and durable as their counterparts. This gives you a sense of Travel Select’s commitment to their product’s durability. 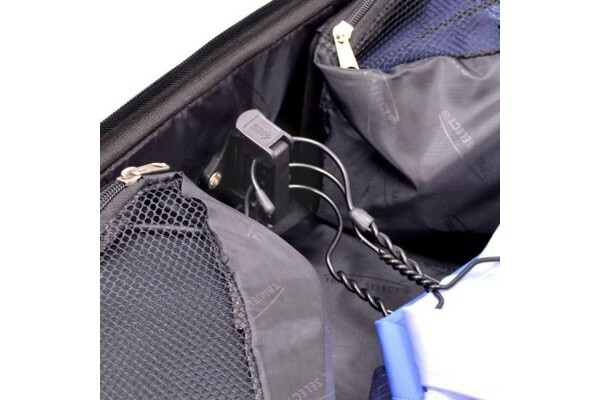 Another very subtle but excellent decision in the design of this rolling garment bag is with a very tiny part of the overall product, the hanger hook. Some cheaper versions will usually go with plastic as a way to save on money while sacrificing quality but not Travel Select. This one has a metal hanger hook and it’s such a nice design feature that I thought it deserved a mention. Finally one little shout out is deserved for the bottom side of this rolling garment bag as the wheels and feet held up very well after a few uses. The feet do a good job of protecting your bag from rough ground and the wheels don’t look any worse for wear. With this and the few other features of this bag in mind the durability for the Travel Select rolling garment bag gets 5 out of 5 stars. The Travel Select rolling garment bag has some decent functionality but could use a tweak here or there. To start with some of the obvious features this bag has a top carry handle along with a detachable shoulder strap. This helps if you need to get around quickly in a crowded or tight area and rolling the bag does not seem viable. This bag also features a center strap; this is built solely for the purpose of carrying an extra bag with you. 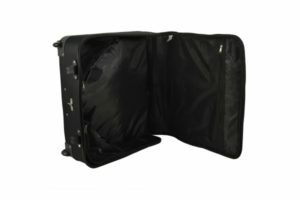 Again as mentioned in the durability section, this garment bag is a roller because it has two inline skate wheels and two non-slip feet. 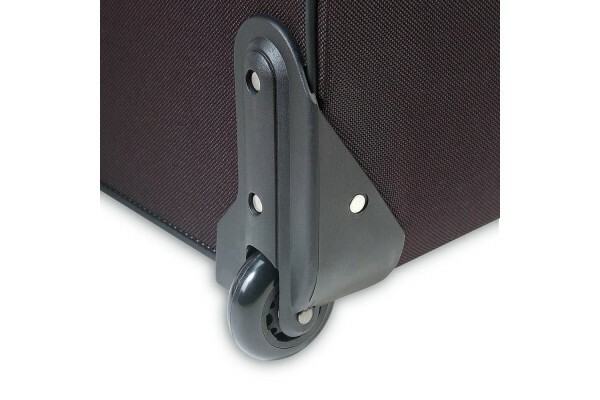 The feet obviously help protect the bottom of the rolling garment bag but some people prefer to have four wheel garment bags like this one from Delsey Luggage instead. So take that for what it’s worth. This Travel Select bag is also very spacious. Its main compartment can hold multiple suits, around 4 for me. It can hold maybe around 7 thin metal hangers if you are not storing suits in the bag or even dresses for the ladies, while longer dresses like maxi dresses may need to be folded. It also provides you with zippered mesh pockets if you wanted to pack in some additional clothes. There’s plenty of space for shoes but unfortunately does not have a great place to put them. This rolling garment bag also provides us with tie straps to keep clothes that you pack in here in place. One very minor aspect that I would have liked to have seen implemented with this rolling garment bag is the ability to actually roll it forward with the handle. What I mean by this is that if I have the handle extended out, I want to be able to push the bag in front of me but unfortunately the handle does not lock in place and usually gets pushed right back into the bag. It’s only designed to be pulled behind you. Again this is a very minor feature but I know it is important to some people. Finally one of the most important aspects with any garment bag is the ability to take it with you as a carry on when traveling. Unfortunately with this Travel Select rolling garment bag the consensus is not quite clear. I have not taken this bag on a flight but have noticed that it will pass carry on requirements for some airlines and not for others. As an example, most people say that you can carry this on Jetblue and Southwest without any problems. It’s when you get to the other major players like Delta, United and Alaska airlines that most if not all people have had to check their rolling garment bag. Carry-on garment bags like this one from Samsonite work better and get you to your destination without having to check an additional piece of luggage. 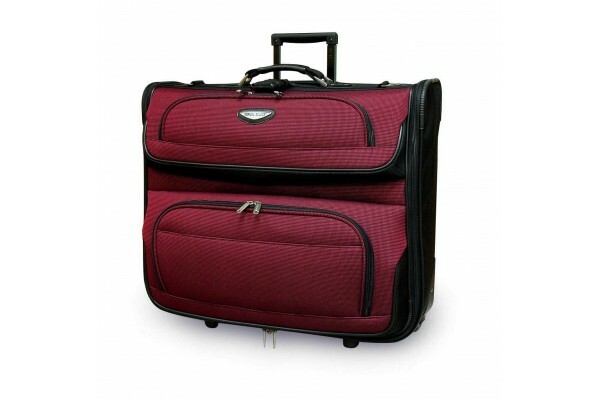 The Travel Select rolling garment bag has quite a bit of functionality but maybe not enough. It has a great setup with the amount of clothes this bag can hold especially when utilizing the tie down straps but unfortunately misses the mark with storing shoes. It can be carried by handle or strap or pulled behind you but cannot be pushed as the handle slides back into the bag. And finally the bag is kind of in a grey area with regards to its ability to meet carry-on requirements. With all of these factors taken into consideration, I have to give this bag an average rating for its functionality. Officially it gets 3 out of 5 stars. 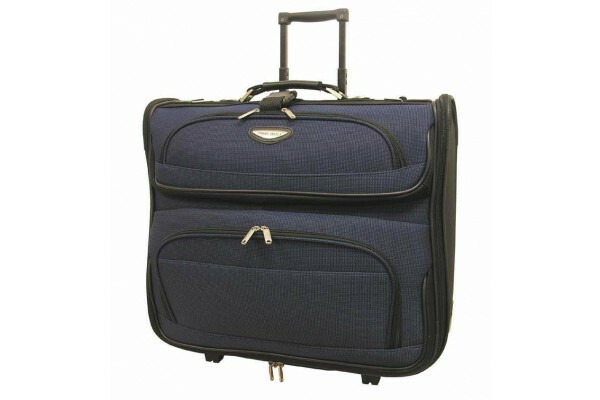 This rolling garment bag by Travel Select has many great features going for it with just a few hiccups. The bag has a couple of different color options available, not bad! Better than just black and fitting in with everyone else. I also mentioned that it had 2 wheels! This is great if you’re used to carrying your garment bag everywhere, like I used to. 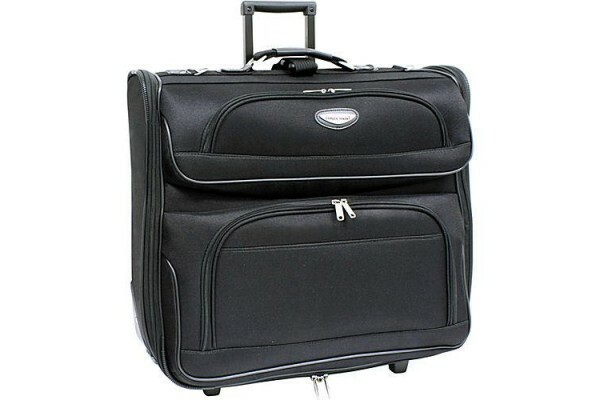 If you’re used to 4 wheels however, this may drive you away but I urge you to consider it since the price of this rolling garment bag is ridiculously cheap compared to some other bags. The bag is very durable and well built. I have used it on a number of occasions and have not run into or foresee any issues with the durability of this rolling garment bag. However one area where there was some concern was with the functionality. The functionality of this bag has its highs and lows and ultimately there was a lot they could have done better to ensure that this bag was top notch. With all of this considered including the very appealing price, I have to give this rolling garment bag a total of 4 out of 5 stars. Have you taken this as a carry-on, have a comment, or just want to review this item yourself? Then leave a comment or review below!